The best physical QWERTY phone in the world? If you're looking for a phone with a physical keyboard and LTE capabilities, this is the phone for you. The keyboard wars are still raging. The argument against physical keyboards often comes down to size - but to some, no price is to great for a keyboard. And make no mistake, the Droid 4 is a brick of a phone, thanks to its signature slider. 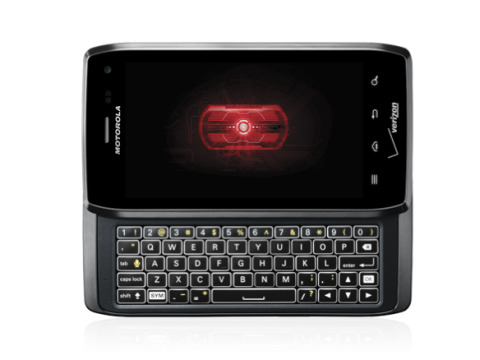 But with the Droid 4, Motorola seems to have reached a good compromise. It's bulky yes, but it's also stylish. At 2.65 by five inches, the Droid 4 is a bit bulkier than the Droid 3, although it's actually thinner this time around, at half an inch thick. Motorola's Droid 4 also managed to gain about half an ounce since the previous generation, tipping the scales at 6.3 ounces. The jutting chin at the bottom is now gone, but the Droid 4 sports the now-familiar Motorola design cues reminiscent of blocky Soviet-era industrial design, and the beveled and slightly rounded edges of the Droid 4's Lucasfilm-licensed Star Wars namesakes (which are basically the same thing). The 4-inch screen sits slightly recessed into graphite-colored plastic casing. Thankfully, the back is covered in a hard rubber material, with a slight texture that provides just enough grip. Without it, the Droid 4 would be taking dives to the ground much more frequently than it did, especially when sliding out the keyboard. Front and back cameras, standard touch sensitive nav buttons, volume controls and mini USB and HDMI ports round out the Droid 4's design. The Motorola Droid 4 sports a 4-inch, qHD 960 by 540 pixel capacitive touch screen, the same as the Droid 3 that preceded it. Indoors, the screen was fine. But when we took the Droid 4 outside into the light of day, things got dicey. The display is just fine, but there's the rub: it's just fine. At four inches, the screen is large, and at qHD 960x540 resolution, it's ¼ the size of a full 1080p HD frame. The 16:9 aspect ratio makes the Droid 4 a natural for watching movies, and the device offers a wide enough viewing angle that you can easily share videos with a friend—perfect for sharing a quick hit of YouTube, although we'd recommend against trying to hold this thing up through an entire showing of the "Final Cut" version of Blade Runner. That said, we wish the screen had a little more pop to it. Colors are accurate, but "accurate" and "engaging" are most definitely not the same thing. Animated menus and wallpapers look great, but video content came across as a little bit dull. And personal tastes aside, things just seemed a bit fuzzy, with text and images not displaying the sharpness we've come to expect from other handsets. Again, it's not a deal-breaker, but ultimately we wanted the screen on the Droid 4 to be more than just OK.
At $199 with a two-year Verizon contract, the Droid 4 is a compelling buy, especially if you're addicted to a physical keyboard. While that's the standout feature, the 4G LTE radio also makes the Droid 4 something of a speed demon.